Where cycling is at a high level, chances can't be taken with what would happen if cyclists were redirected from safe and direct cycle-paths onto busy unpleasant roads. The result could be a catastrophic change in how people travel. If people have unpleasant experiences when cycling, they are likely to give up and make their future journeys by a different mode. This is why a comprehensive grid of very high quality infrastructure which keeps cyclists away from cars is essential to achieve the cycling potential of any area given local demographics and geography. It's also why in the absence of safe cycling infrastructure, no amount of training results in people cycling more. The details are important. This temporary traffic island makes it possible for people to stop in the middle of the road in safety. In the video, a teenage boy starts to cross the road against a red light and benefits from this island. Note that just as at permanent crossings, cyclists are not required to stop in the middle and wait for another light. Crossing the road is always achieved in one motion. Though this is a temporary cycle-path, the give way line is marked in an obvious way and there is a very flat transition between the road and the cycle-path. In fact, this temporary cycle-path is smoother than the service road to which it connects. 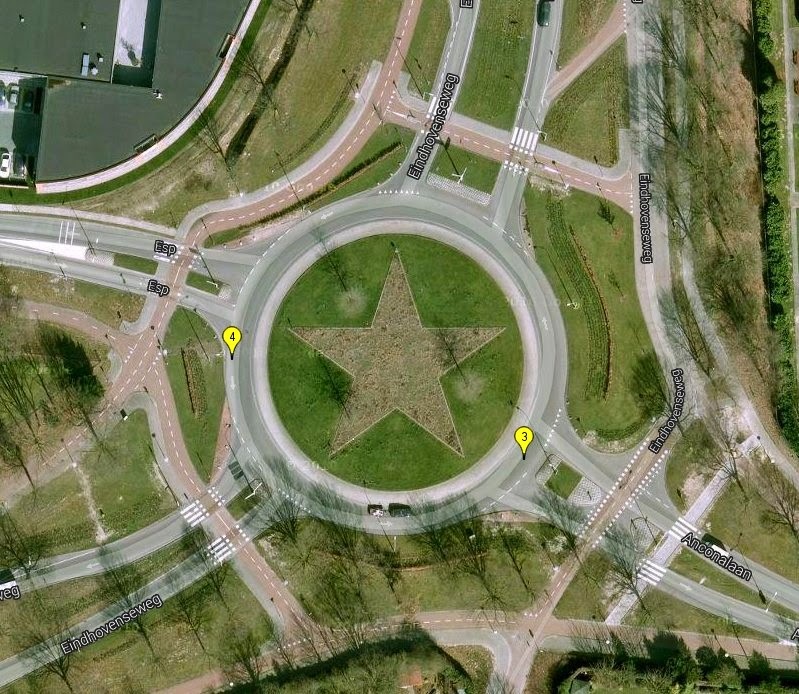 The signs, markings and signals are all familiar to anyone who is used to Dutch cycling infrastructure. There is nothing new to learn, no surprises due to anything operating in an unusual way. This consistency leads to safety. 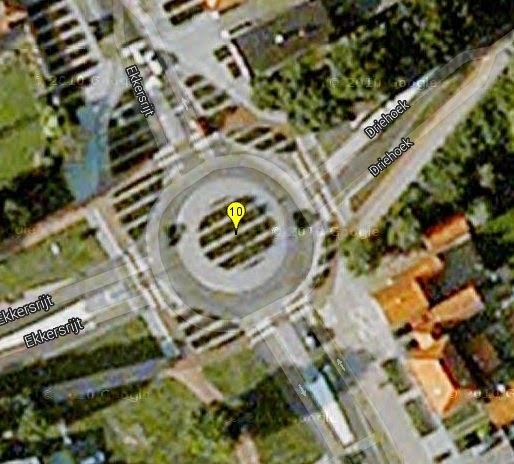 In this instance it was not possible to construct a temporary crossing right next to the old crossing. Therefore the redirection signs had to be clear and obvious. 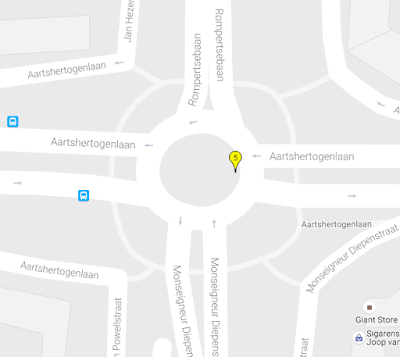 This sign design is standard for redirections during road-works. This is not an example of something exceptional, but of the norm. In the Netherlands it is normal that cyclists' routes are maintained when cycle-paths have to be dug up. 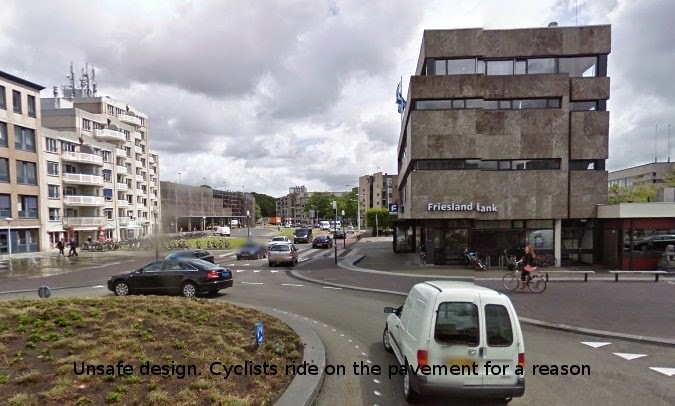 Please read the many other examples of road works vs. the Dutch cyclist going back six years on this blog or see other examples of maintenance. 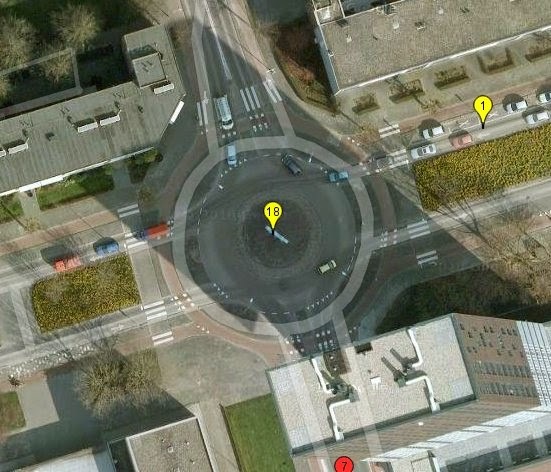 For cyclists, the safest and most convenient design for traffic light junctions is the simultaneous green. With this design, cyclists always make their maneuvre in one and directly. There are never inconvenient and unsafe two stage turns, never is there the possibility of being "hooked" by motor vehicles turning across a cycle lane between other traffic lanes, never do you have to merge with motor vehicles making the same or other maneuvres and there's never a requirement to find your way forwards to dubious safety of an advanced stop line or to make your way across several lanes before the junction to get into the correct lane to make a turn across traffic. Simultaneous Green gives cyclists their own green phase during which they may travel in all directions at once, including diagonally, following their own desire line across the junction. While cyclists are crossing, all motor vehicles are held behind red lights. When motor vehicles are moving, all cyclists are held behind red (with the exception of often being able to make a safe right turn). It's obviously convenient. Is it really safe ? Because these junctions remove cars from the road when cyclists are riding on them, the main danger to cyclists is removed. 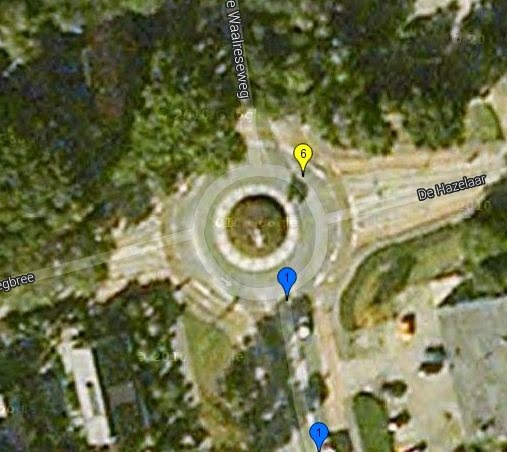 The result is that cyclists crossing simultaneous green junctions are rarely involved in collisions and even more rarely injured. 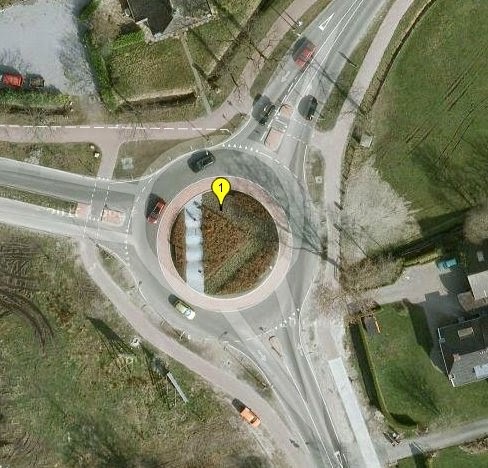 These are extraordinarily safe junctions for cyclists. 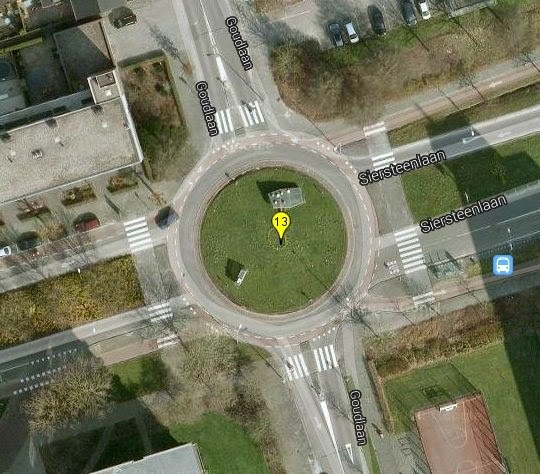 Between 2007 and 2012 Only one incident involving a bicycle was reported at all of the simultaneous green junctions in Assen added together and that incident didn't result in an injury. People sometimes wonder how it is that cyclists don't collide with one another while crossing diagonally. There are actually good reasons for this. 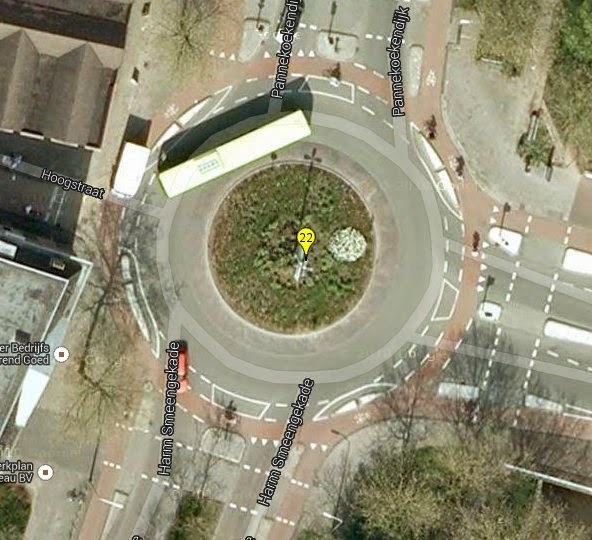 The whole area of the crossing can be used and peoples' desire lines don't cross at the same point in time. It's not mere opinion which leads me to call these safe junctions. 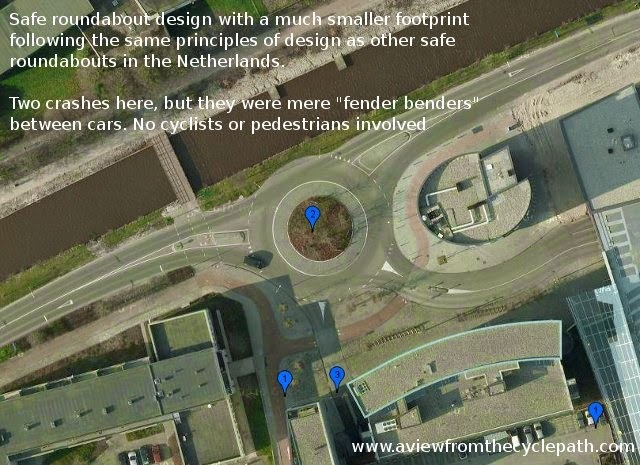 There are figures to support this and they show a stark contrast between the impressive safety record of simultaneous green junctions, of which there are many in Assen and Groningen amongst other Dutch towns but at which cyclist injuries are virtually unknown, and the relatively bad safety figures seen at shared space and other less well engineered junction designs. 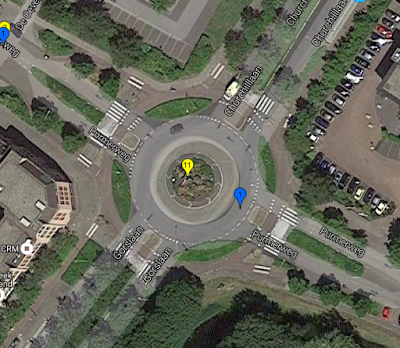 What's more, simultaneous green junctions are also subjectively safe. Who doesn't feel safe to cycle when there are no cars moving ? 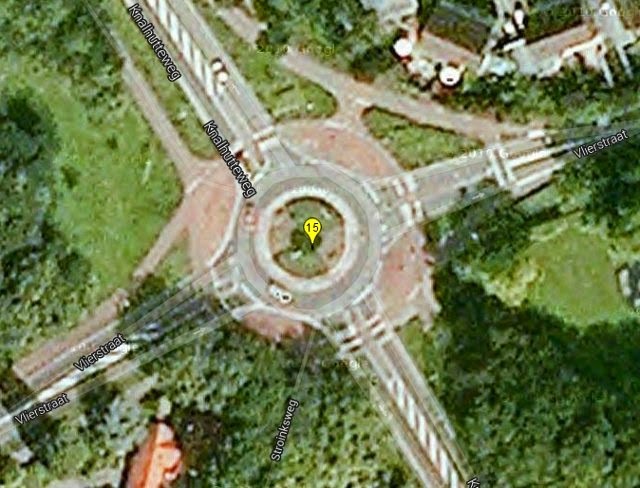 The result is that this type of junction empowers vulnerable road users rather than dis-empowering them. did not result in an injury. Why isn't everyone asking for this design ? 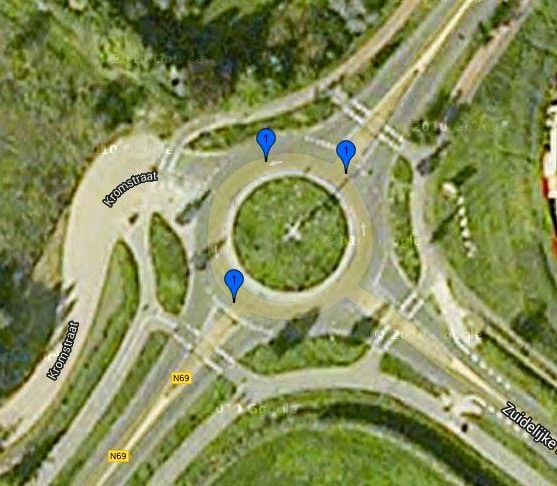 I've been writing about the benefits of simultaneous green for many years now and we have been demonstrated these junctions to hundreds of people on our study tours but somehow it's not easy to get the superiority of this design over others through to people. This is a superior way of using junctions but it suffers from a lack of familiarity. There's no one size fits all design that people can take away. 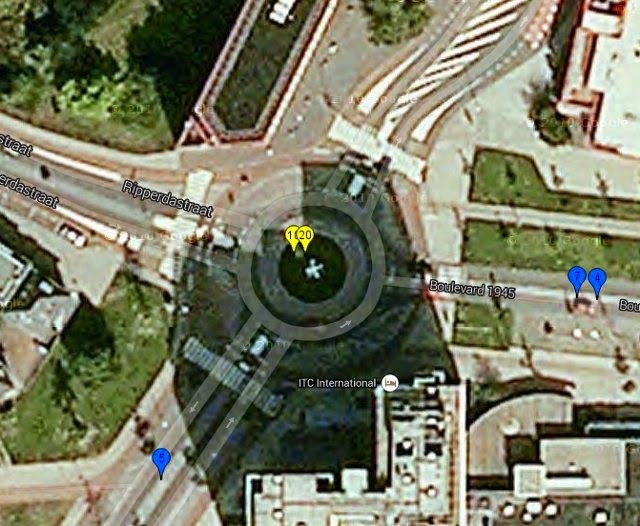 This is not about We show a variety of different sizes of simultaneous green junction but we find that people still find it hard to understand how this scales to all sizes of junctions. Some think it takes a lot of space or takes too much time from other modes. None of these things is true. Simultaneous green principles apply well at all sizes of junctions and we've found that in all cases it works extremely well. What's more, all the junctions we're aware of have great safety records. How much impact on other modes ? There also appears to be a perception that safety and convenience for cyclists has been achieved by making the junction inconvenient for other modes. 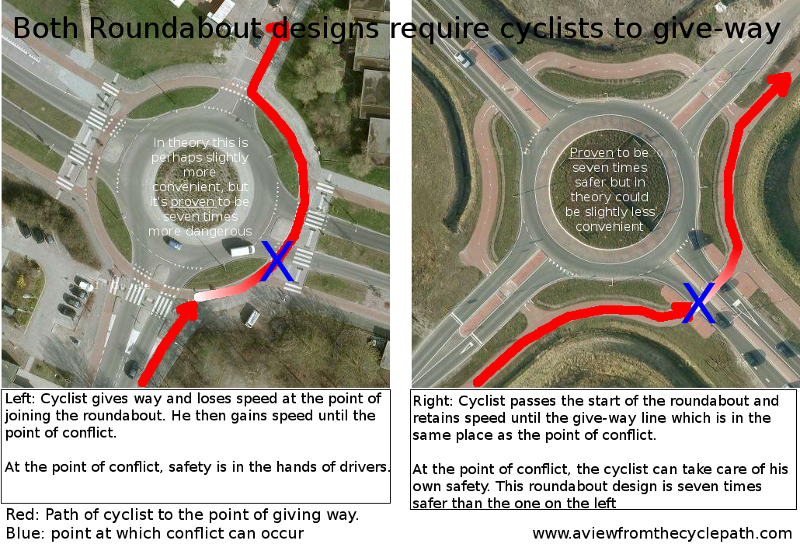 While it's true that these benefits are the result of cyclists having the entire junction to themselves when they cross, it should be remembered that cyclists travelling in all directions at once make the very best use of the space while they do so. Because of this, even very large junctions can be cleared by big groups of cyclists from all directions at once in a very short time. After they're clear, there are no cyclists left on the road who could in any way inconvenience other modes. 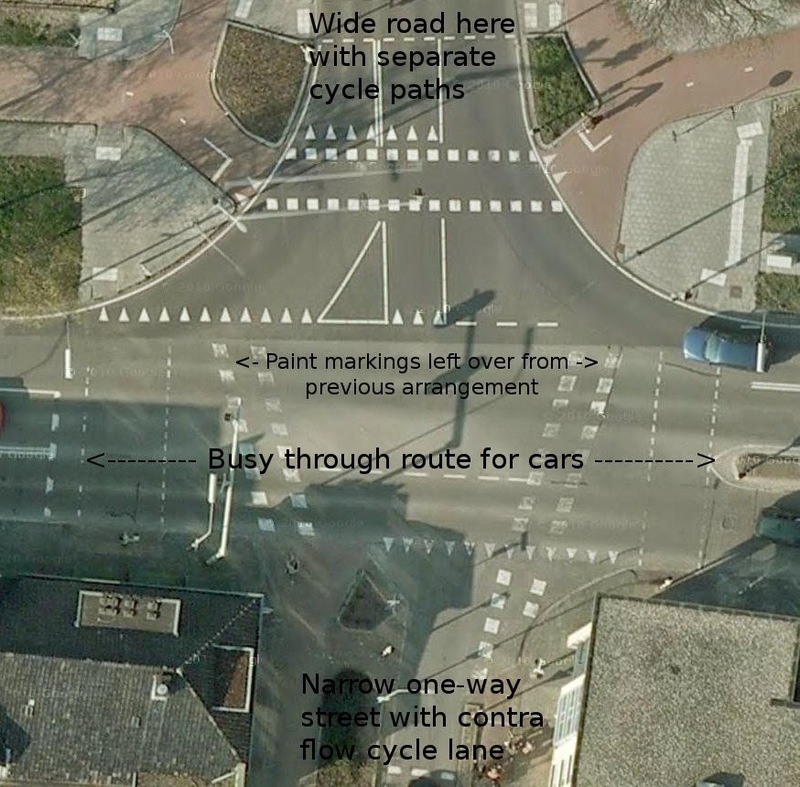 What's more, drivers don't even have to do so much as cross an empty advanced stop line because there is not reason for there to be an advanced stop line and they do not have to negotiate road space with cyclists either on the lead up to the junction, while crossing or at the other side. For all these reasons, simultaneous green leads to very efficient use of the junction. Because cyclists' light are completely independent of those used by drivers, more advanced possibilities are on offer than are possible merely by synchronizing with the cycle used for cars. It is often the case that cyclists are given more than one green phase during each cycle of the lights, meaning that the average delay by bike is half that by car. When simultaneous green is combined with being able to make a safe right turn against a red light, which it very often is, the average delay for cyclists, taking all desired directions into account, is reduced even further. This helps to encourage cycling, which itself improves journey times for motorists. 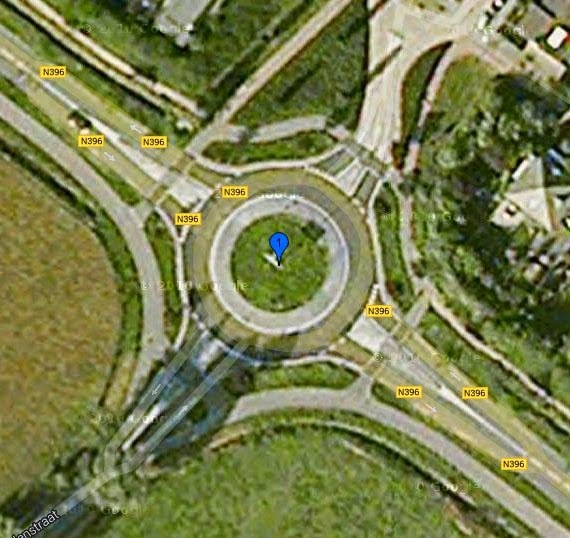 The same junction as shown in the video above. There are ten lanes here. Four in each direction for general traffic and an additional two lanes for buses only in the middle of the car lanes. From the cycle-path on which we approach you can turn left (diagonally) or go straight onwards. Note the right turn lane for cyclists, which takes cyclists around the corner entirely separately from the road and does not require stopping at a red light at all. 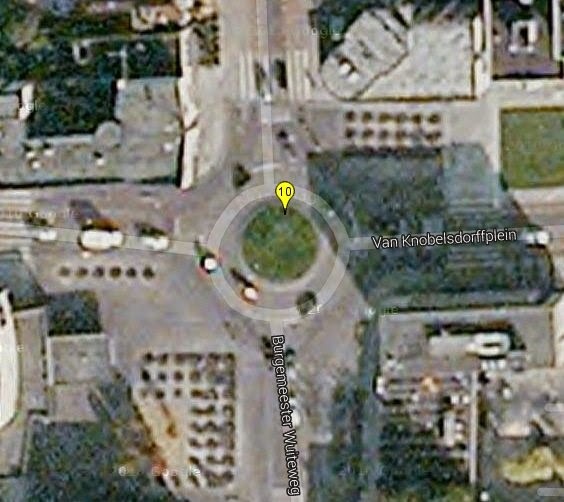 There is more about this junction in a much older blog post. A wide bidirectional cycle-path leading up to a medium sized simultaneous green junction. This is the same junction for which I showed the accident record above. 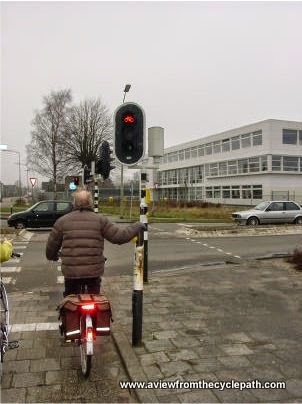 Right turns, and also left from a position to the right of the photo, are possible here against a red light simply by riding around the corner on the cycle-path. The same junction from a different angle. The narrower road leading up to the junction from this direction has just an on-road cycle-lane, but safety and convenience are enhanced by a kerb for a short distance before the junction which also assists integration with a simultaneous green junction. The blue sign gives specific notice that right turns are allowed against a red light. The same junction again, this time from a third angle. In this case, a 2.5 m wide single direction cycle-path leads up to the junction. The corner of this junction which appears on the far left of the photo is that which featured in the first photo. The blue sign shows that right turn on red is allowed here. A smaller junction and a narrower cycle-path which still allows bidirectional use by cyclists. 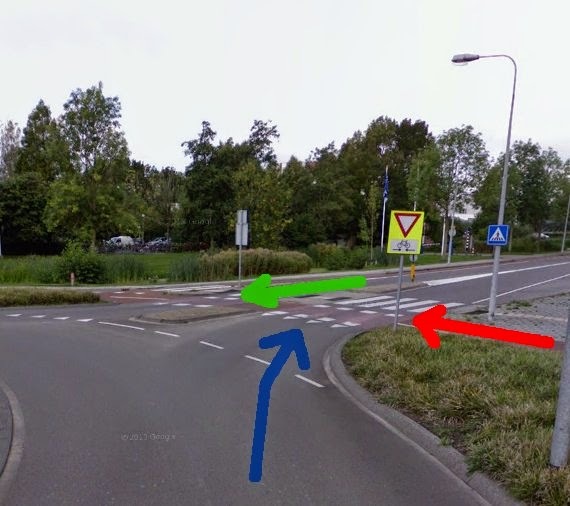 Right turn on red is accomplished by turning right on the cycle path which goes around the corner to the right just off the edge of the photo. On the other side of the same road, facing the last photo. This is a very narrow one-way street for cars which has on-road cycle-lanes to allow bidirectional use by bike. A short section of cycle-path is used to provide a waiting area for bikes. 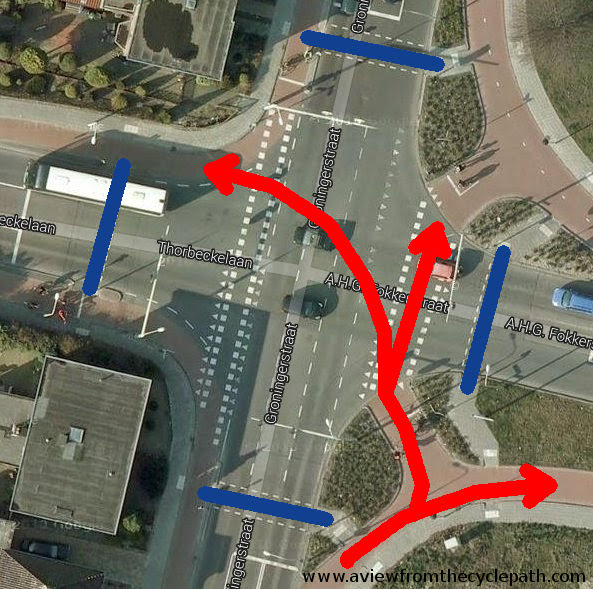 Those who wish to make a left / diagonal turn use the left half of the cycle-path. Those going straight on use the right half. Simultaneous green scales easily to small junctions like this. Because cyclists must cross the road to head to the right, right turn on red is not possible in this instance. At the end of a feeder street in a residential area which has no specific cycle provision at all, this bridge is wide enough to provide a small length of cycle-path which provides safe access and a waiting area for cyclists using the simultaneous green. The cycle-path on the far side of the road is bidirectional so we cross the road to turn either left or right and in both cases cross the road first. In this case, right turn on red is not possible. 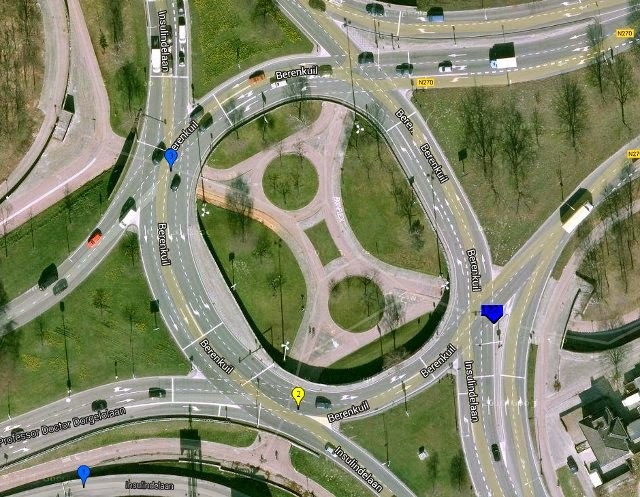 I hope with this blog post to have busted myths about Simultaneous Green being difficult to implement or only being suitable for large junctions. In fact, it works extremely well at all sizes of junction from the very small to the very large. The only way to improve upon simultaneous green is to remove traffic lights from cyclists' routes altogether. 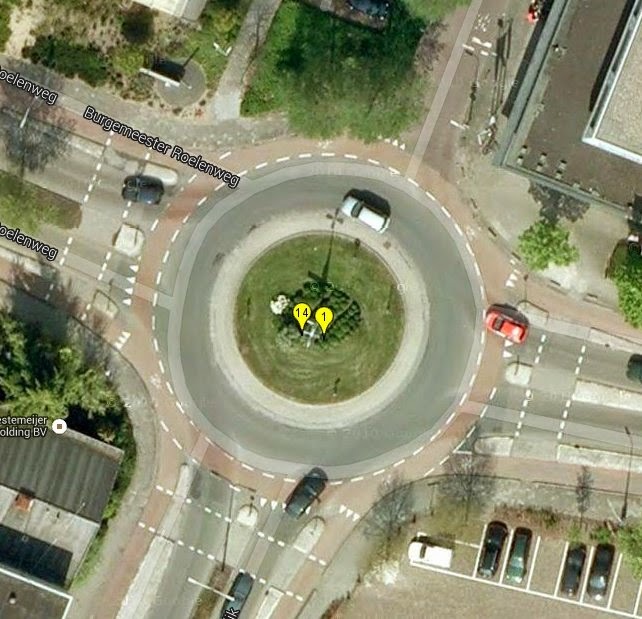 Assen provides a good example of how to design so that traffic light junctions are mostly away from cycle routes. Where cyclists and traffic lights come together, simultaneous green is by far the best solution. 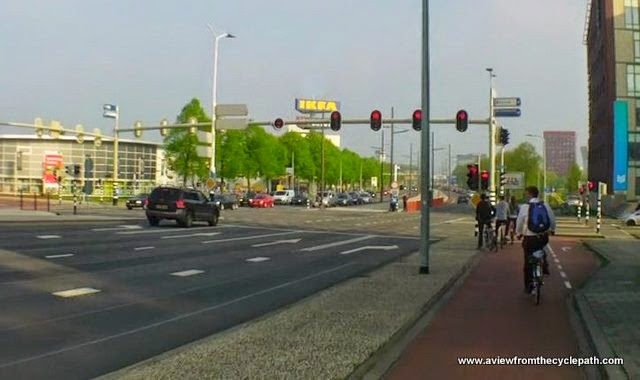 Almost any other design of traffic light junction creates more problems and danger for cyclists than does this, yet it is these other ideas which are given prominence in design guidelines around the world. this at the start of 2007. 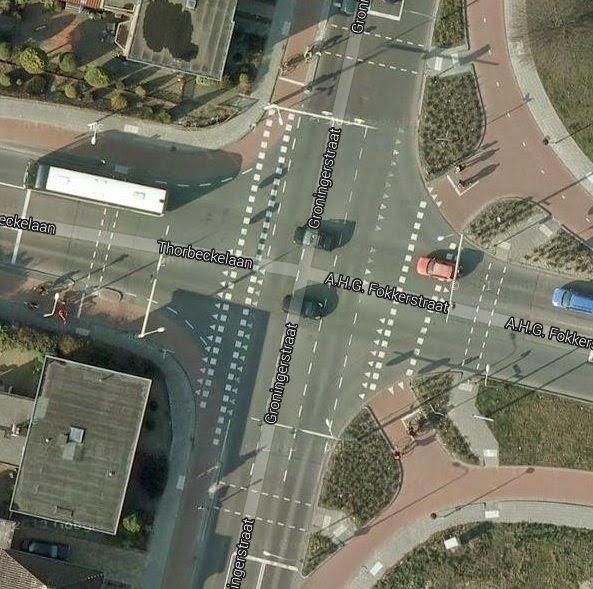 The much pushed but somewhat mythical "standard Dutch junction" is not a terrible solution but it is less safe and less convenient than simultaneous green. 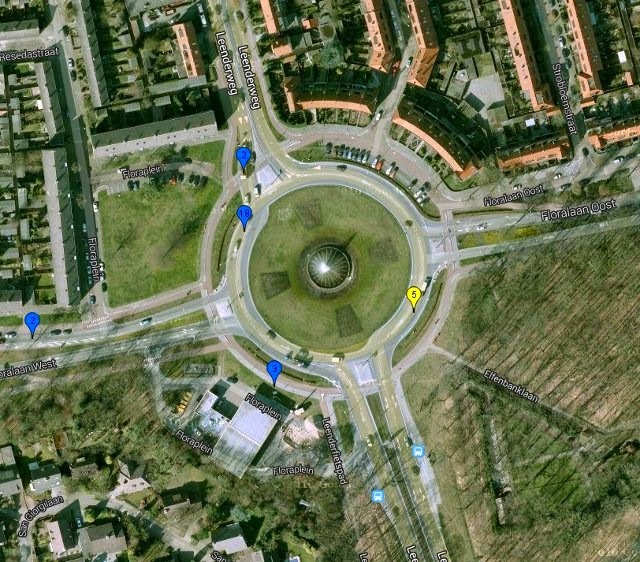 Copenhagen Left type junctions are not only inconvenient because they require cyclists to stop twice and divert from their desire line to make a turn across traffic but they are lethal in their home country so likely to be lethal in yours too. Advanced Stop Lines simply don't provide any real protection for cyclists at all and centre of the road cycle lanes which are sometimes used to provide a way to turn across traffic at ASLs encourage cyclists and drivers to cross each others' paths. Shared Space junctions have far higher injury rates and especially cause problems for the more vulnerable road users. What happens to pedestrians ? bike from one corner shown in red. Pedestrians must also be accommodated by any junction design. It's not practical to allow pedestrians to walk diagonally across at junction at the same time as cyclists are doing the same as this causes conflict. However, provided that pedestrian crossings are outside of the cycle crossings, as shown in the picture on the right, pedestrians can cross in all directions other than diagonal at the same time as cyclists use the simultaneous green crossing and without any conflict at all. The time taken for a cyclist to cross a wide road is considerably less than that taken by a pedestrian so there is no extra impact on traffic light cycle times from the point of view of motorized modes due to allowing simultaneous green at the same time as pedestrians are allowed to cross. meaning that there is no conflict at all. In practice it is necessary at wide junctions to provide central reservations with additional push buttons to operate the pedestrian crossing. This is required to accommodate people who walk slowly. That can also be achieved without any conflict though it's never very pleasant to be in the middle of a road. 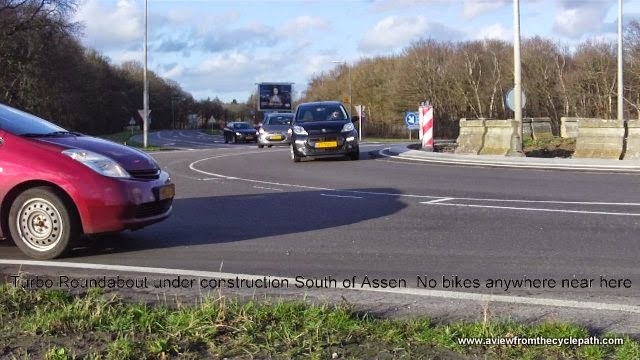 It should never be necessary for a cyclist to cross any road in more than one stage, even if riding diagonally, even if crossing ten lanes of traffic as shown in the video above, because cyclist speeds are higher than pedestrian speeds. 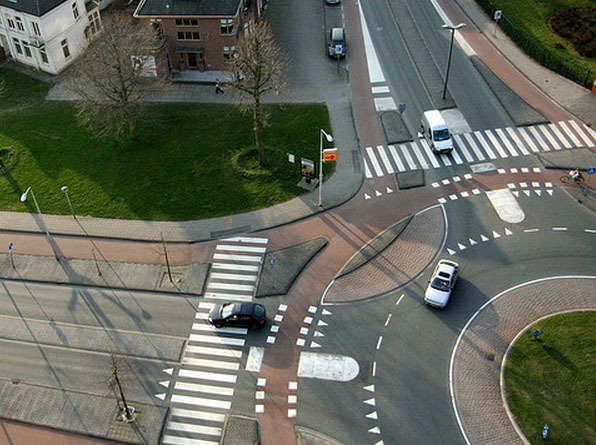 Groningen's simultaneous green crossings use zebra crossings across the cycle-path in an attempt to give pedestrians priority over cyclists. Unfortunately, they placed the pedestrian crossings in front of the cyclist stop lines. The problem with this design is that it can result in a pedestrian reaching the far side of the road just as cyclists are given a green. Cyclists are therefore delayed entering the junction and may be tempted to jump a red light. This potentially converts a minor bike-pedestrian conflict into a more serious bike-car conflict. 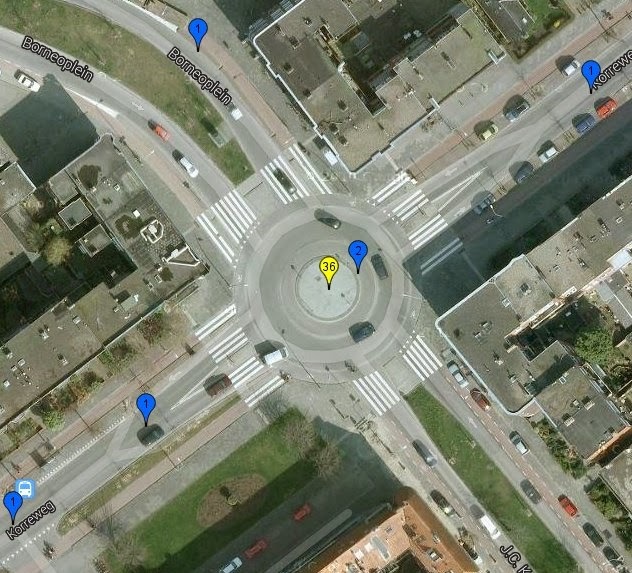 In Assen a superior design is used which places the pedestrian crossings completely outside the cycle crossings. 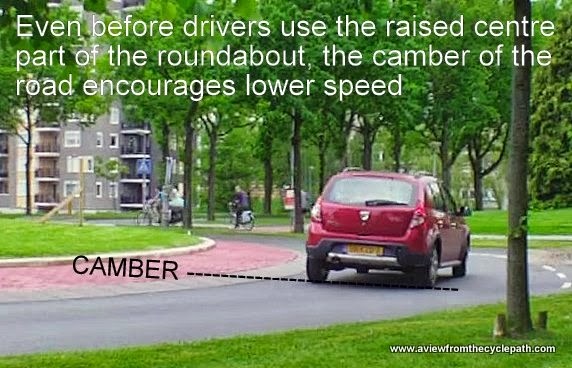 Therefore cyclists can always go without delay when they have a green light, and pedestrians never clash with cyclists. 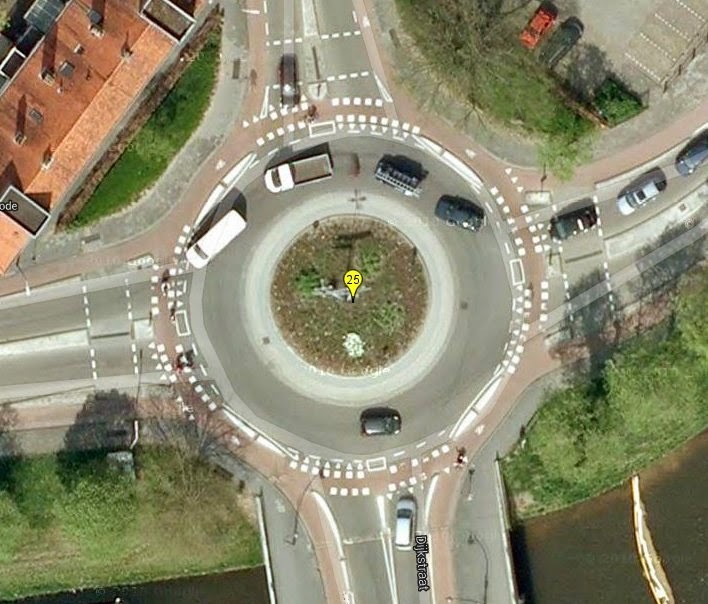 In some cases, a roundabout may be more appropriate, but this requires good design. 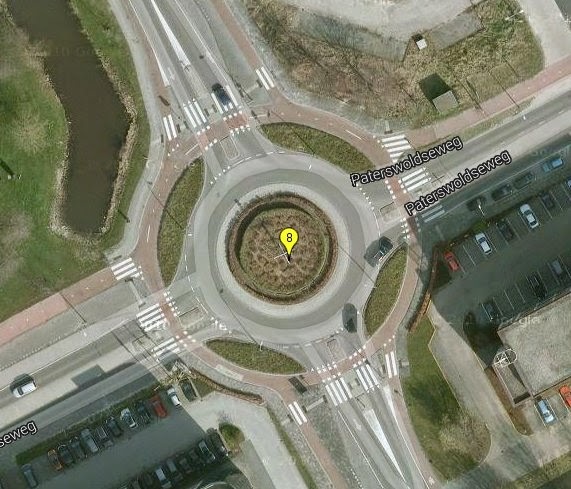 Not all roundabouts are equal. 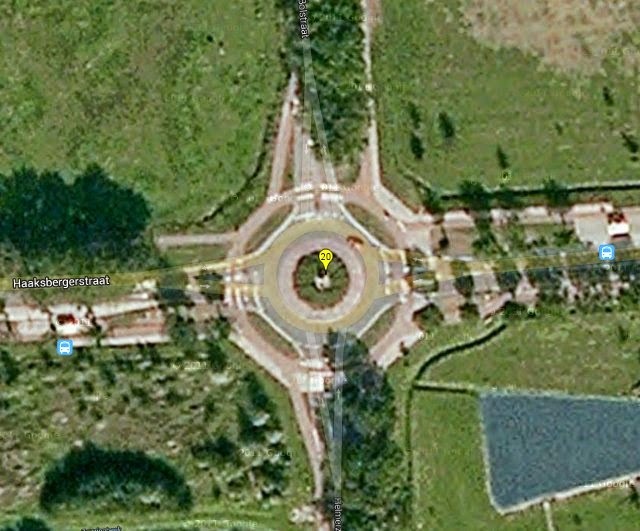 Not even all Dutch roundabouts are equal. Some have extremely good accident records while some do not. 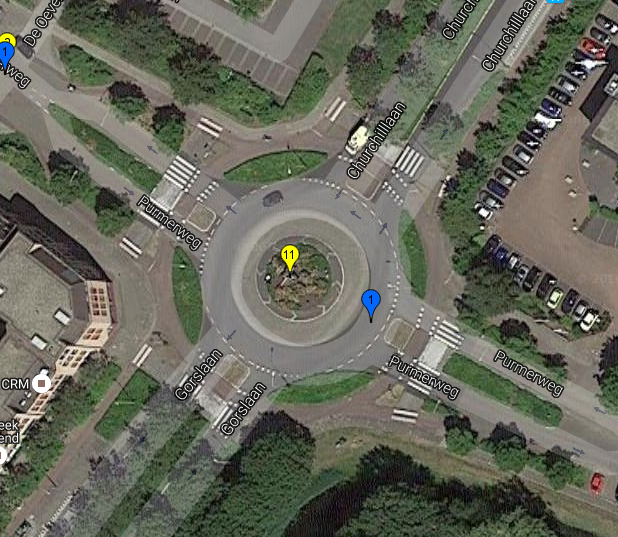 Simultaneous Green is by far the most convenient design of traffic light junctions for cyclists. What can be more convenient than following your desire line across a junction ? This is also now an extensively tested solution which has proven to be extremely safe - this is objectively shown by viewing the online map of collisions. 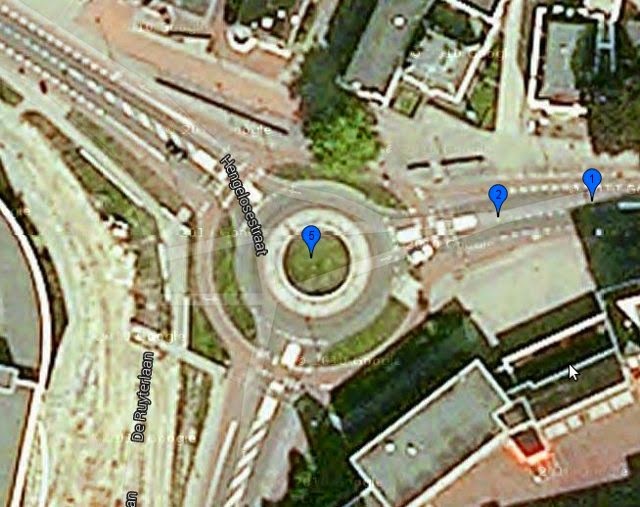 This junction is more convenient and safer than the mythical "standard Dutch junction", much more convenient and very much safer than the proven lethal two stage turn design and it also has also proven to be far safer for cyclists than shared space junctions even when those are on a smaller scale, catering for a much smaller number of motor vehicles. 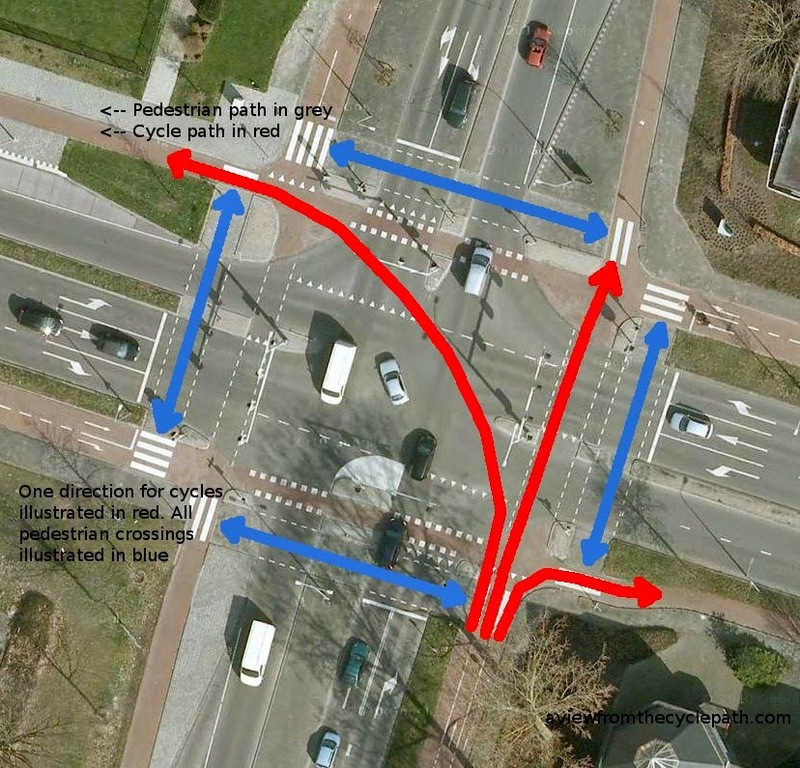 Given the advantages and the flexibility of simultaneous green, this is the junction design which cycling organisations the world over should be trying to emulate. It may take some changes to your local laws to allow the required signage and to change to way in which traffic lights are sequenced, but these are human constructs which are changed all the time. The advantages of Simultaneous Green are such that it is truly worth campaigning for. It's not new (I've been writing about it for six years) and it's not an unproven idea. It's popular with cyclists because of its convenience and has proven to be safe. 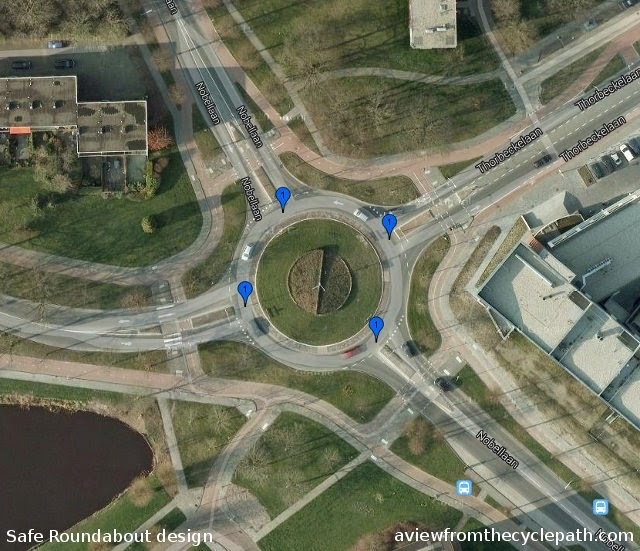 Enough time has passed that had campaigning for this junction design started when I first wrote about it, your laws could already have been changed to accommodate this style of junction. Get campaigning! 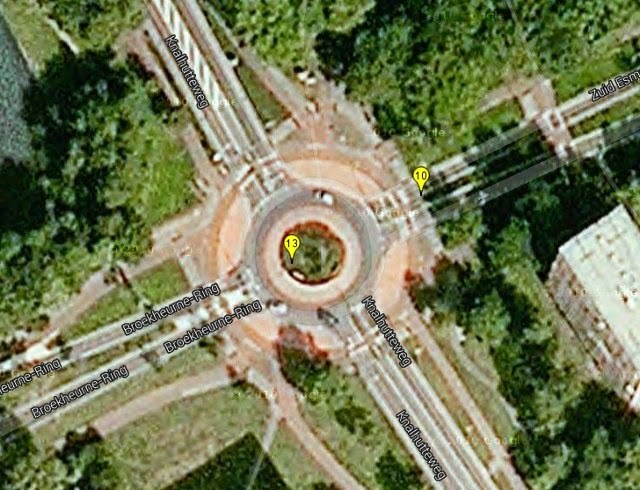 Previous posts about simultaneous green junctions include many videos and photos of other examples. If you think that six years doesn't sound like much time, remember that it took only eight years for the Netherlands to transform the whole country enough to be inspirational.